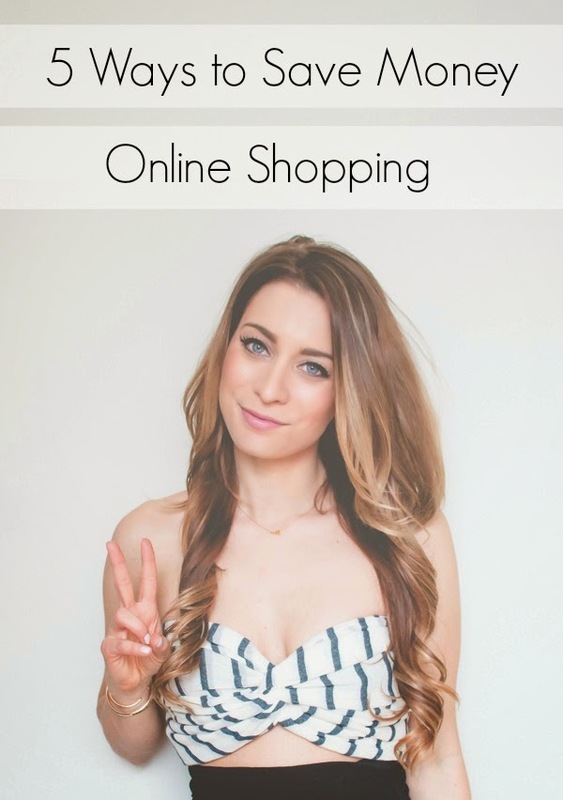 5 Ways to Save Money Online Shopping | La Petite Noob | A Toronto-Based Fashion and Lifestyle Blog. As I have mentioned in countless other posts, this Noob is not rich - far from it, actually. I am also notoriously a saver, so the amount of disposable income I allocate every month for retail therapy is fairly modest. Living on a modest clothing budget can be difficult, especially when blogging about personal style, but I have developed a few tips and tricks to really maximize my budget - especially when online shopping. Online shopping has revolutionized my shopping habits. I've always been one to go crazy over a good deal, but shopping smart online has almost guaranteed that I never pay full price for anything in my closet - especially for bigger ticket items like designer sunglasses and purses. Read on to find out my five best tricks for saving money while shopping online. I have a definite roster of online boutiques, brands, and department stores that I frequent often, and I am subscribed to ever single one of their mailing lists. Yes, you will have to deal with some irritating spam and some very enabling e-mails, but you will also be first up to hear about upcoming sales, on going sales, coupon codes and special offers. Often stores will have flash deals that only last a few hours (departments stores are notorious for this), and their mass e-mails will alert you of these. Other stores tend to put certain categories of inventory on sale, for examples 'all shorts 30% off' (J crew tends to lump their sales like this) and being on an e-mail list will alert you of this - perfect if you've been eyeing a certain piece but refuse to pay full price for it. I really take advantage of subscribing to e-mail lists for the fact that it allows you to act quickly on sales, which is a huge advantage when you wear very common sizes that tend to sell out quickly. Bonus - some online stores even give you a coupon code for an additional percentage of savings off, or free shipping, just for subscribing to the mailing lists. Mailing lists are a great way to learn of online sales, but sometimes you've just got to have that certain something right away and time is of the essence - that's when google steps in. Oh Google - how did I live without you? Although I spend the majority of my Google-time looking up cute puppies, or seeing what all the Real Housewives are up to (admit it - you have some crazy google habits too), I also use the search engine to save money. I rely on Google to find coupon codes for general online retailers, but it really helps me out when I'm eyeing a particular item. Here is my system: I type the item that I'm interested into Google - lets just say it's the Frye Carmen Harness Boots. Once the results load, I find every reputable retailer that sells the boots online and open each page up in different tabs on my browser. Now that I have about five to six retailers, I then open up an additional window on my browser and search Google for coupon codes for each individual retailer. When I find a coupon code, I enter it into the retailer's website (which I already have open to the product on my browser) to see if it will accept it (sometimes the code is expired or is under brand restriction). Whichever tab in my brewer generates the highest amount of savings is the retailer that I will purchase the boots from. Simple! Waiting for major holidays is a trick that proves fruitful time and time again - online retailers will always hold some sort of special during a holiday and waiting to shop until those sales will result in some great savings! The trick for us Canadian folk is to wait until major holidays in the United States - you won't find many retailers hosting large sales for Canada Day, but you can bet that there will be lots come Independence Day. Subscribing to online forums dedicated to sales, and saving money are genius for both online shopping as well as day-to-day purchases. I am an avid subscriber of Red Flag Deals (for us Canadians), and scour the forum for deals that other's have found that relate to me. My Mac Book was actually purchased because a thread on Red Flag Deals had alerted me of an incredible price for the computer and I couldn't pass it up! This forum even saves me money on groceries, alerting me of incredible specials going on at local grocery stores. The only drawback to this sort of money-saving method is that you have to act quick - when someone shares a particularly incredible sale/deal, the product is quick to sell out. Online shopping is a great resource for saving money, but it's important to pay close attention to the retailer's return policy. I have fallen victim to this one too many times - I purchase an item online without ever seeing it in person, or after never trying the item on. My purchase arrives in the mail and it is not what I had anticipated, or doesn't fit. I try to return the item to the retailer but I neglected to notice that they do not accept returns, or their return policy is so difficult that it almost isn't worth it. I now only shop with online retailers who have a seamless return policy, or accept in-store returns within an acceptable amount of time from purchase (I like 30 days or more.) Saving money on an item is fantastic, but if it goes un-used or un-worn due to a shady return policy then it is just ultimately money wasted. Do you follow these same tricks when shopping online? Do you have additional tips that you use when online shopping? From one frugal Noob to the next - let me know! Kate Spade has THE best flash sales ever! I got my $500 leather briefcase for 75% off. It was insane! It's almost not worth it to pay full price, except for the smaller items that tend to sell out really quick. I don't own any Kate Spade purses, but I just checked out the website and the merchandise is so cute! I will definitely keep my eye out for the flash sales. Thanks for letting me know! Find free voucher codes, discount promo codes, grocery coupons & hottest deals from hundreds top retailers. Save up to 100% by Coupon Color awesome offers.